Below the mountain called St. Angelo a Tre Pizzi which stands 364 m, there is a church dedicated to St. Maria a Castro. 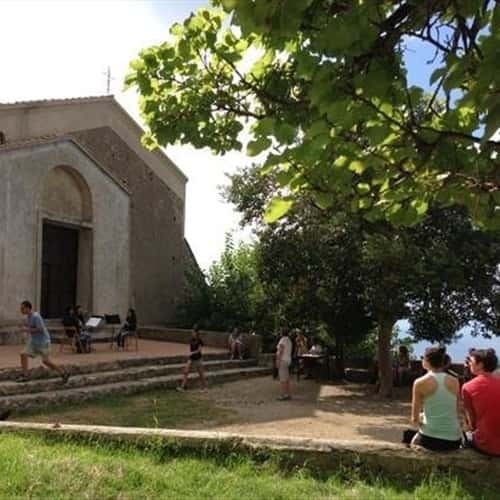 Surrounded by some wonderful flora and fauna that is so typical in these mountain areas, this is also where the monastery of St. Domenico is situated. From this magnificent place you can admire a breathtaking view overlooking Vettica Maggiore, Positano, Li Galli and the island of Capri. The first official document regarding this place is dated 1599, a document of Naples University that allowed the monks to build the monastery. The interior structure is composed of two levels, on the first one there are four cells and a kitchen, on the ground floor an oven and cistern. Inside the church there are many paintings. On the walls of the left nave there is one dating back to 1439 called Madonna delle Grazie, and recently removed sections of the wall allow most parts of the work to be seen. In the Church of Saint Maria a Castro there is a large fresco that has remained unchanged for centuries. Generally referred to as the "Madonna delle Grazie" (Lit: "The Madonna of Thanks"), in recognition of the miracles that Our Lady has continually granted. Dated from around 1400, the fresco occupies an entire recess, or niche, in the left nave of the church. The upper section is occupied by an image of the Blessed Christ surrounded by angels and the saints Peter and Paul. In the lower section, the Virgin and infant Jesus are seated on a throne, also surrounded by angels and saints. The precise identification of the saints is difficult to ascertain. It is to be noted that the saint dressed as a Bishop has been redone. Some particulars, such as the tightly curled hair and the Bishops mitre are slightly difficult to see in the newer plaster. To the left, under the saint with the pen and book (possibly Saint John the evangelist), a small procession of people dressed in modern clothes most likely represents the sponsors or donors of the work. The principal elements of the composition, both in size and importance, are Christ and the Madonna. The other figures seem to revolve around them. The Christ seated on the throne (in late Byzantine style), and the canopied throne of the Madonna (modern classical style) are organised in a calculated manner. The angels and saints occupy the remaining space to complete a well balance design. The artist (unknown) appears to be well aware of, and adept in the use of, the artistic style of the renaissance, which at the time was maturing in Naples and throughout the Mediterranean area.